I just spent several days talking with scientists and lecturing in Australia. 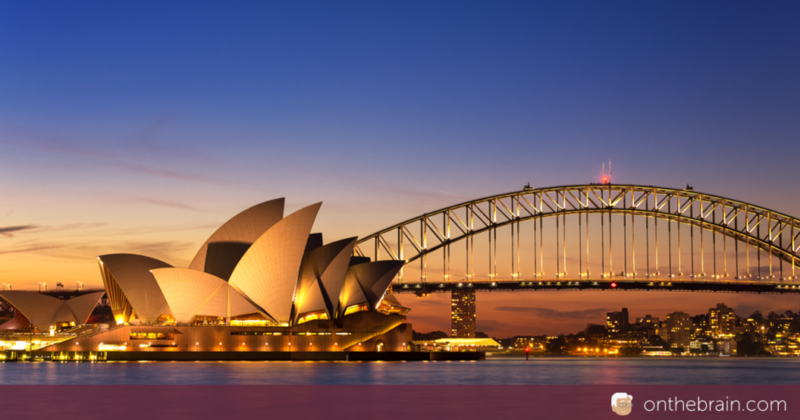 The summer months (our winter months) are a wonderful time to travel Down Under. The cities are lively, the sun is out, and people are in cheerful mood—which is amplified just a little more in Australia than I most places in the world. I’ve been trying to help an Australian team operating in Queensland and New South Wales develop a new model for a treatment center designed to address the neurological distortions that impact children that just happen to have had very difficult childhoods. Such efforts there and in the US, are, alternatively, very encouraging and very discouraging. On the encouraging side, I met with individuals in every place that we visited who recognize the problem and understand the great need for better solutions. On the other hand, there are a lot of impediments in the way of intelligently restructuring how we deal with these kids. Many professionals in many venues have a vested interest in caring for or minding or training or controlling these children; many see themselves as owners of the help and treatment landscapes; many naturally view any new approach as being just a little bit insulting, and threatening. Perhaps the biggest problem in establishing better practices stems from the incredibly clumsy and messy apparatus that has already been put in place to help the millions of life-long card-carrying members of our Outcast Society. There is a swamp of ‘treatment’, ‘education’, ‘law enforcement’, ‘mental health’, ‘medical care’, ‘alternative school’ ‘employment services’, ‘foster care’, ‘institutional care’, ‘family support’, ‘juvenile courts’, ‘substance abuse rehabilitation’, and other efforts already targeting the younger-age cohort in this large neurologically distressed population. Alas, despite the fact that so many good people are trying to impact this population in so many different ways, the net result of all of this effort is, by any measure, disappointing. 15-20% of Australian children are substantially neurologically impacted by stressful or culturally impoverished early environments in ways that clearly greatly attenuate their prospects for academic and social success. High stress or abuse drives changes in the neuromodulatory processes that enable learning-driven change in the brain. Neglect drives changes in the brain-changing experiences that are required to advance the child’s brainpower. These problems impact the normal positive changes that underlie brain system ‘maturation, and that account for reliable, stable, refined brain operations. A common consequence: At the time the child enters school, they have limited attention control, and relatively poorly resolve perceptual inputs. Their predictable lack of academic and social success in their early school life magnifies the weakness of their plasticity-controlling machinery, and adds to their neurological burdens. The ultimate consequence for such a child is a far higher risk for academic difficulty; school dropout; addiction; mental illness; emergent conduct disorders; promiscuity; bullying and violence; misdemeanor/felony arrest and probationary monitoring or incarceration; unsuccessful initiation of employment; homelessness; and future bad parenting. Nothing currently being done on any significant scale in the great nation of Australia will change this picture anytime soon. As the dimensions of the problem and the costs of addressing it grow apace with little to show for it, the time is ripe for bring new science to bear, for (once and for all) addressing this problem closer to where it really lies, i.e., in the stress-, deprivation- and abuse-distorted brains of these innocent young individuals. Our big new idea is a “community Sharper Brains healing center’ that supports all of these other efforts, using technologically-supported ongoing big-data assessment and brain training-focused renormalization strategies. This new support center’s treatment model is based on our science, and on a study supported by the Benevolence Society in Australia, where a number of the most difficult children in this population were brought into an intensive day-treatment environment. These hyper-reactive children could not, at entry, be sustained in school or in a standard foster care home; all required continuous monitoring and support in a residential care facility. Costs of such wrap-around care are enormous (about $300k/annum), even given the relative modest rehabilitation services provided by those facilities for them. Most of these children are sustained in these group-home environments over a period of years—which is a clear manifestation of the fact that they are not neurologically repaired through these experiences. On the other hand, in the Benevolence Society study model, all treated children were brought back under control to a level in which they could return to school and to a standard foster family home over a period of about 1 year. The magic? A combination of 1) motivational training focused on explaining how the problem was the brain’s (and not the kid’s), and could be overcome; 2) meditation-directed training designed to calm the child, and to re-establish an acceptable level of reliable self-control; 3) intensive computerized brain skills training designed to recover basic higher-functioning neurological abilities (processing speed and accuracy; attention control; distractor suppression; response inhibition; working memory; memory acquisition and retrieval; elementary social cognition skills) and to restore more normal organic brain health; 4) re-socialization, designed to strengthen social attachments and to elaborate more complex aspects of social cognition and social control; and 5) a ‘return-to-school’ strategy designed to assure that the child was prepared, over the course of training, in ways that could help assure their success public school re-entry. Our proposed ‘healing center’ shall add four additional key assets. The first is a complex, embedded assessment strategy documenting every aspect of training and treatment in the healing center, related to broadly documented neurological, behavioral and personal gains attributable to training. As a part of this analysis, we shall make an intensive effort to document every relevant aspect of the long-term fates of every individual who enters training, in a “big data” model in which every child is a participant in this grand, truly-revolutionary experiment. The second is a training center designed to help all of the stakeholders in all of the silos described above understand the neurological bases of these children’s struggles, and designed to train them to help them understand the role they must play in helping these children find their way back to mainstream society. The third is a support center for parents and foster carers. They’ll also be given access to aspects of this training program, accessed via a smartphone. As a part of this program, children in training shall also be given smartphones for at-home monitoring and support. The fourth is a support center for schools and youth employment charities, designed to help schools mount a second form of this healing center treatment model in public schools and youth-employment programs, there focusing on children who are stable enough to complete an effective program within schoolhouse walls. By this strategy, the goal is to help everyone out there—first of all, the struggling child—then, in close succession, the parent, foster parent, institutional carer, social welfare worker, psychologist, teacher and school administrator, police, judges and court officers, prison officials—then, in a final stage, those individuals of an older age who have been carrying these neurological burdens with them across the spans of their lives—EVERYONE, now working together, to reduce the numbers of the innocents amongst us who, without better help, are so likely, through no fault of their own, to have a frustrating, limited, and socially destructive life.